Potential champs of the Leaders Division lack leadership from its Head Coach. To say the Badgers 2012 football season has been disappointing is an understatement. Once a top team in the nation (according to those all-so-accurate pre-season polls), the current Badgers squad is lucky to be 4-2 – a decent record diluted by the strength of opponents faced. So what’s changed from the past two seasons that resulted in Rose Bowl berths? There’s been the roster turnover that every college program faces and an exodus of coaches following Cryst to Pitt. But the real issue resides in the supposed leader of the team: Bret Bielema. We all know Bielema struggles with certain in-game coaching and went to the Andy Reid school of clock management. But beyond these typical blunders, Bielema’s leadership has failed this team. When Paul Cryst left for what he thought was greener pastures, he took with him a number of assistant coaches. New to the program was Mike Markuson, former O-Line coach at a few SEC schools, who infused a new system of coaching. The new system just didn’t register with the Big Ten way of play and incumbent starters. After a paltry start to the run game, Bielema fired Markuson after two weeks. The decision may have been the right decision. But, it’s a decision that wreaks of desperation only two games into the season. By firing Markuson two weeks into the season, it sends the wrong message to the team. The new coaches start worrying about their jobs, rather than the next opponent. And players start blaming the assistants for their poor play. In essence, blame is placed elsewhere, rather than on the coach and/or players. And even if we assume that Bielema did the right thing in firing Markuson, it still falls back on him in the initial hiring. The replacement coach, Bart Miller, was with the program before and likely would have continued the previous system that has proven successful. Yes, Miller may be under-qualified, but if he’s proven himself to the point that he was quickly named the replacement coach, he likely had proven himself to be worthy of the hire in the off-season. It takes a leader to embrace the issue, take the brunt of the blame, and work through it with the coaches and players. A quick-trigger in firing Markuson tries to dust the issue under the rug. Another decision in the off-season has also cropped up early in the season. Like 2011 when the Badgers obtained free-agent Russell Wilson, the Badgers were able to sign another free-agent signal caller in Danny O’Brien. Of course, unfair expectations were placed upon O’Brien to replicate Wilson’s great season. Bielema smartly tried to separate the two and not allow the comparisons to be made. But this lasted briefly. After the Badgers were fortunate enough to defeat Utah State (after another terrible timeout almost cost them the game), Bielema benched O’Brien in favor of walk-on Freshman Joel Stave. In the off-season, Bielema raved about O’Brien’s skill set and thrusted him into the starting role. Even with the offense sputtering with O’Brien under center, Bielema needed to further back O’Brien, continue to distance O’Brien from Wilson, and let him work through the inevitable bumps in the road that comes with a transfer and new offense for everyone. And unlike Wilson, O’Brien has two years of eligibility in Badger red. He is the immediate future at the QB position, before paving the way for either Bart Houston, a four-star redshirted QB, or Chance Stewart, a newly signed stud recruit. By benching O’Brien in favor of a lightly recruited, redshirt Freshman Stave, Bielema likely has undermined O’Brien’s confidence going forward and he will not fulfill his potential in Badger red. A leader was needed to calm the public’s concern over the offense. A leader was needed to further support the new QB and give him time to grow into the system. The team was still 2-1 at the time and had another non-conference game to hopefully improve. It was simply another quick-trigger, act of desperation in hopes of jump-starting the offense. Now, I know you may be thinking – there’s some truth to that, but Stave has looked rather impressive and has the prototypical size for a QB. Putting aside the fact Stave is a redshirt Freshman walk-on (because talented players are often overlooked by the current recruiting business – yes, it’s a business), even Bielema doesn’t fully trust his new starter. Though Stave has played most of the minutes, O’Brien has subbed in randomly that is confusing to say the least. And Stave has had a tight leash during the two-minute drill, most noticeably at the end of the 1st half against a truly terrible Illinois team. With timeouts somehow not blown through, the Badgers got the ball around their own 40 yard line with ample time to move the ball into field goal range, at least. Yet, the Badgers go 3-and-out on three play-calls that would have made Brad Childress blush. This play-calling and decision-making demonstrates Bielema’s true confidence in Stave. And it’s not pretty. And not the type of confidence a leader needs to have in a key player. Sitting at 4-2 and struggling to every victory, the Badgers still have a realistic opportunity to win the Leaders division and return to the Big Ten Championship game. Because both Penn St. and Ohio St. are ineligible for post-season play, the division comes down to UW, Purdue, Indiana, and Illinois – not exactly murderer’s row in the Big Ten. 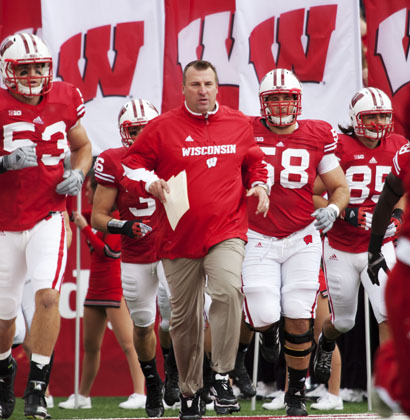 It’s ironic that the Badgers should win the Leaders Division without a leader head coach. This entry was posted in Badgers v. Gophers and tagged Andy Reid, Bart Houston, Bart Miller, Brad Childress, Bret Bielema, Chance Stewart, Danny O'Brien, Joel Stave, Leaders Division, Markuson, Mike Markuson, O'Brien benched, Paul Cryst, Stave starting, Wisconsin football, Wisconsin offense issues. Bookmark the permalink.